I’ve been on holiday for the last few days, enjoying the last week of my three weeks off by taking a trip with my Mum and Aunty Linda to Taupo to have some volcanic adventures! The trip was amazing and we all had the best time ever… it was hard to come home but when I walked in the front door, saw my lovely KB, and looked around my colourful, happy little lounge, and saw Raymond on my (his) rocking chair, I felt pretty pleased to be back. I’m going to share some pictures of my trip today, which I hope you enjoy! But first, wow…. my heart is going out to all of the people in Queensland and Brisbane right now…. those floods, it’s just devastating and seeing the pictures makes me feel very, very sad. My dad told me that it has stopped raining now, what a relief, but I’m sure that like all of the other disasters that have been occurring worldwide in the last couple of years alone, that the clean up and healing will take a long time. 1. I won a giveaway!!!!!!!!!!!!!!!!!!!!!!!!!!!!!!!!!! I wanted to win this giveaway soooooo badly, I asked the Universe… no… BEGGED the Universe that I get picked and I DID! The lovely Penny from Planet Penny which is one of my all time favourite blogs drew the winner while I was away, so make sure you pop over and see what I won HERE! And if you haven’t already, you’ll meet Higgins who is fabulously naughty but makes up for it with his cuteness…. Thank you Penny! I’m thrilled! 2. The lovely KJ Sunflower has started up a flickr group called Crochet inspired by Crochet with Raymond, the link to this is HERE and what an exciting moment as I clicked into this! Thank you Lovely! I’m loving seeing the pictures, and in fact, am getting inspired myself from it, so pop over and have a look! In fact, I’m going to do some emotional blackmail here, pleeeeeeeeeeeeease go and join this group so it reaches a reasonable size! hee hee! So…. now let me tell you all about my trip! First, I suggest you have a veeeery quick look at this post and remind yourself of these beautiful volcano shots I took when I was travelling to Taupo a few months ago, when they were all covered in snow and freezingly beautiful! Remember it’s the middle of Summer here now (bliss!) 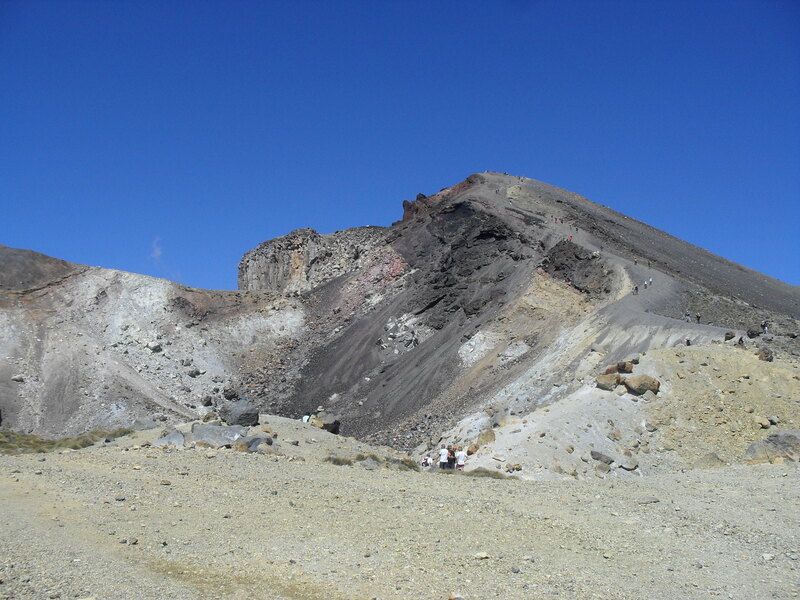 and when my Mum and her sister Linda decided to do the Tongariro Crossing, I decided to come too, because if you remember, I love volcanoes and these three, Ruapehu, Ngauruhoe and Tongariro are three of the best! 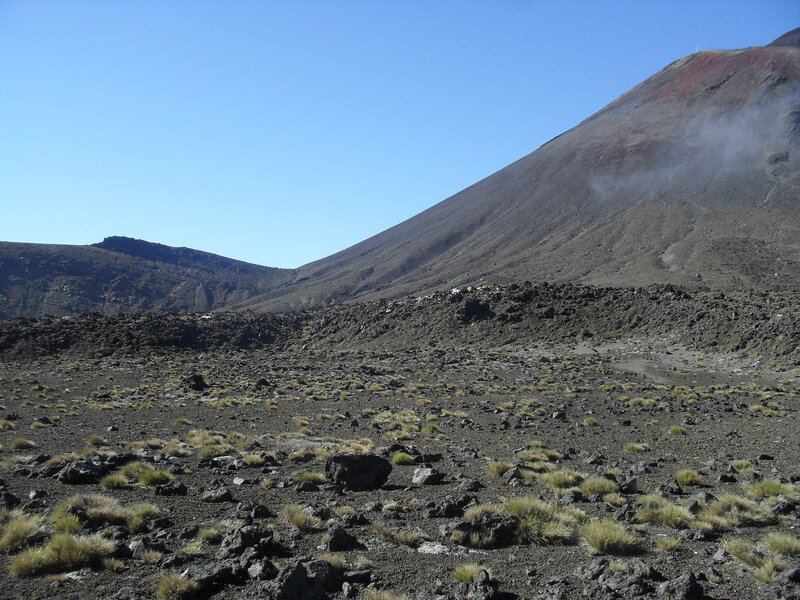 The Tongariro Crossing is described as New Zealand’s best day tramp, it’s a “challenging” 19km tramp across Mt Tongariro which I think is 1158m high if I remember from the guidebook! We drove up to Turangi on Sunday and on Monday the conditions were perfect for the tramp. The pictures I’m going to show you are very special, because you can only see these views if you walk 10km up a mountain! I hope you enjoy taking the trip with me! On Monday morning three alarm clocks went off at 4.45am, we got dressed in our tramping gear and packed our bags with everything from thermals, raincoats and lunch to barley sugars and even a flare (!) -My Mum likes to be prepared for everything, which makes her a great tramping companion!- We got picked up at 6am by a shuttle and driven to the foot of the mountain, and began our tramp at 7am. At this point, there was low cloud, but by 8am it burned off in the lovely hot sun, by which time we were well on our way! 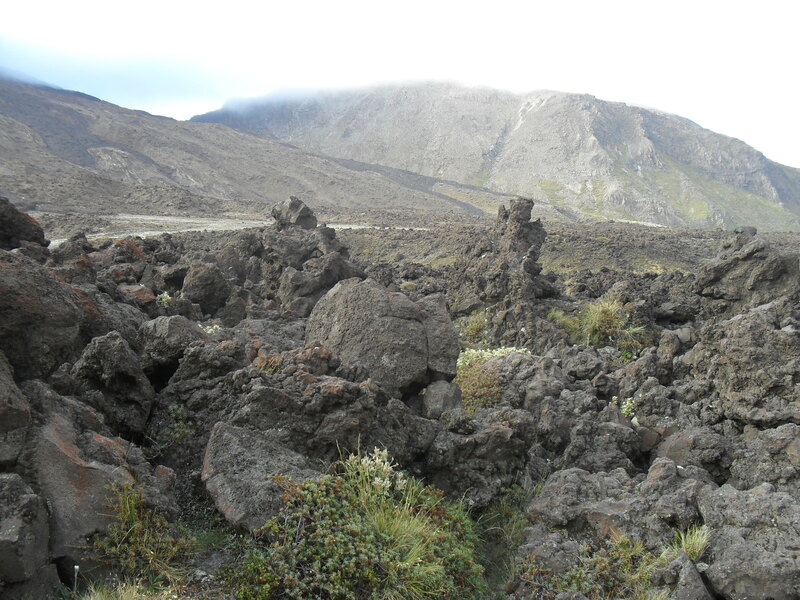 The first hour is lovely and easy, it’s reasonably flat and the trail makes its way through volcanic rocks which are black and look a lot like coral…. We reached the first incline, called the Giant’s Staircase, which went up and up and up and up and up for about an hour, walking up through big boulders and up many flights of man-made stairs! We had forgotten our map, which didn’t matter as the track was marked, so we had no idea where we were when we reached the top of the first incline. At the top, we found a crater. Now, remember, these three volcanoes are all active, Ruapehu last erupted in 1997 I think, maybe 1996, and we were reminded of this by the steam coming through vents in the sides of the craters. 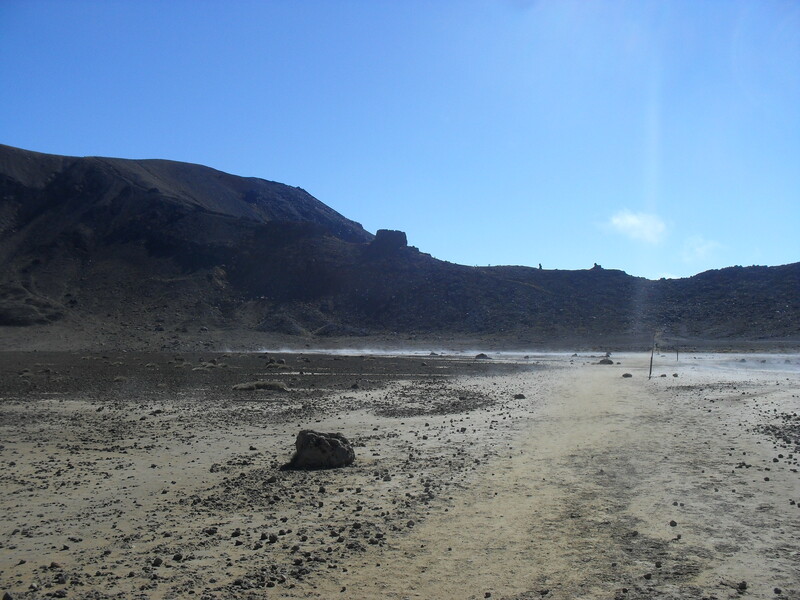 This picture shows the beginning of the first crater we came to. No words can describe what it felt like to walk through this huge, vast space… It was like being on the moon, right up high, away from all infrastructure, it was incredible. 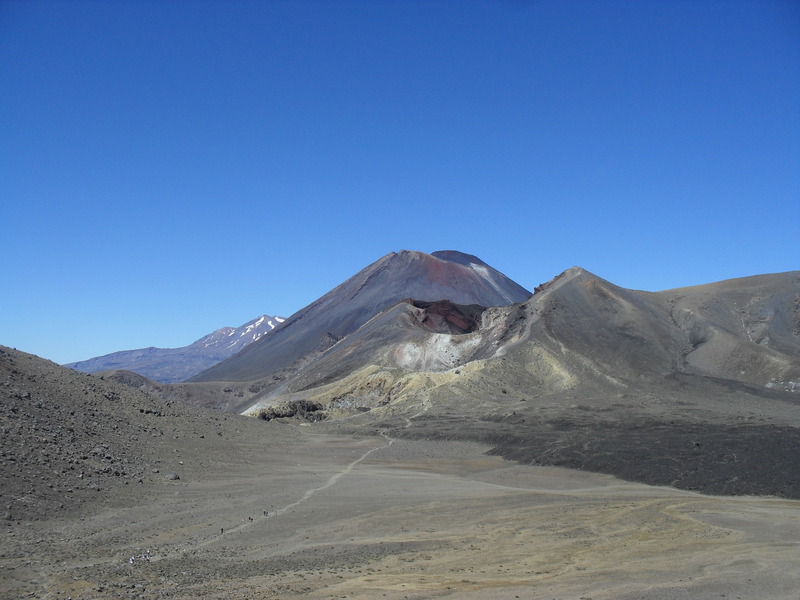 The mountain off to the right is the base of Ngauruhoe, the perfect, cone-shaped wonder that was covered in snow in my last travelling post! At the edge of the crater, we saw teeny teeny tiny people at the top of this hill on the right…. that’s the crater floor we’re walking along, and if you care to zoom in close, you can see little ant sized people up there on the ridge…..
Well, we said, the book said “challenging,” and we’ll eat our lunch at the top of the hill! The views were breathtaking, and when we were at the top of that incline, we discovered we still had further to go before we reached the summit! At this point the track had become very… errr… rugged, meaning there was no track, and it was along a thin ridge. Mum got what she called the “doo-daas” and like many others, didn’t want to go too close to the edge, because it was a loooooooooooooooong way down! 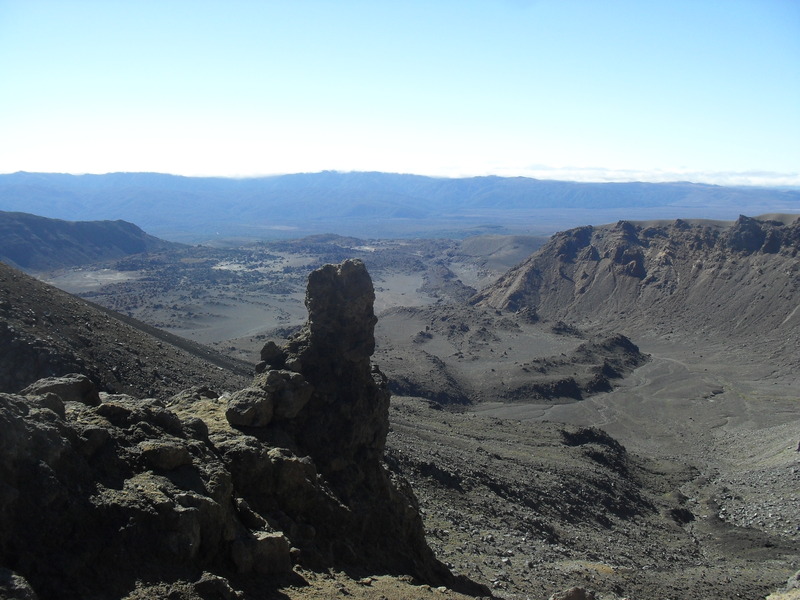 So we walked up the last little bit to the summit, and the incredible views of the Red Crater. At the top of the summit, when I could drag my eyes away from the Red Crater, I discovered the view of the Blue lake, another crater, which is, well…. see for yourself! Perfection! The plan at this point, was to stop for lunch, but being at the very summit, we saw that we had an extremely steep climb down a slope covered in scoria. Do you know what scoria is? It is sharp rocky gravel that slides down with you when you walk on it! it took a little while to discover how to run down it, but once I worked out that you dig your heels in and run, I ended up at the bottom pretty quickly! As you can probably tell by the adjectives I’m using in this post such as “breath-taking!” “Incredible!” “Perfection!”, I was pretty blown away by the scenery and the magnitude of the mountain. Well… the best was yet to come. The Emerald lakes are one of the main reasons I wanted to do the walk, to see these wonders up close. Full of sulphur, they are old craters which have become little lakes of the most incredible, amazing, perfect colour. Do the colours in these lakes blow your mind? I was in awe of them, completely and utterly. We stopped for lunch here, to savour the view as much as possible…. Just to the right of the lakes, you can see there is a steam cloud coming out… we thought the lakes would be hot, as there are many thermal pools in this area, but they are in fact freezing, so no swimming occurred! Onward we travelled, towards Blue Lake, making our way across yet another vast empty crater… it was at this point that I looked back and discovered that the summit, and the scoria slope were in fact the lip of the Red Crater, the centre of Tongariro, and I nearly started to laugh in amazement…. what a journey…. If you look very closely in the above picture, you can see teeny people coming down that veeeeeeeeeery big scoria slope…. We carried on past the halfway mark (Oh my, only halfway???!!!) up another incline, and stopped to admire the view of the three volcanoes, all in a row, a view you can only see from here,that is not visible from the road or any other point. 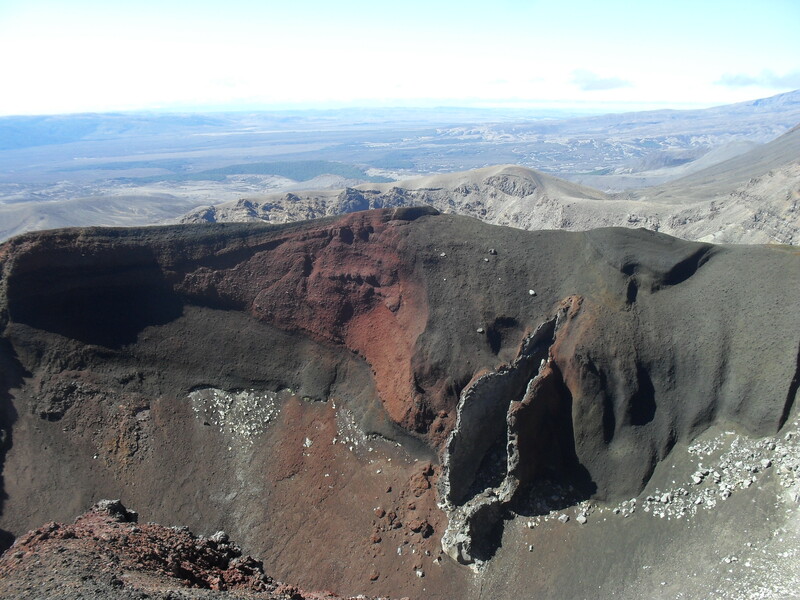 Tongariro, with the Red Crater is in front, Ngauruhoe with the perfect cone is in the centre, and Ruapehu at the back, still with snow on top despite the season. I’m not going to show you a picture of me in the cap. The views, despite the sore feet and lack of iPod, were amazing on this side too…. above is Lake Rotoaira in front and Lake Taupo at the back. 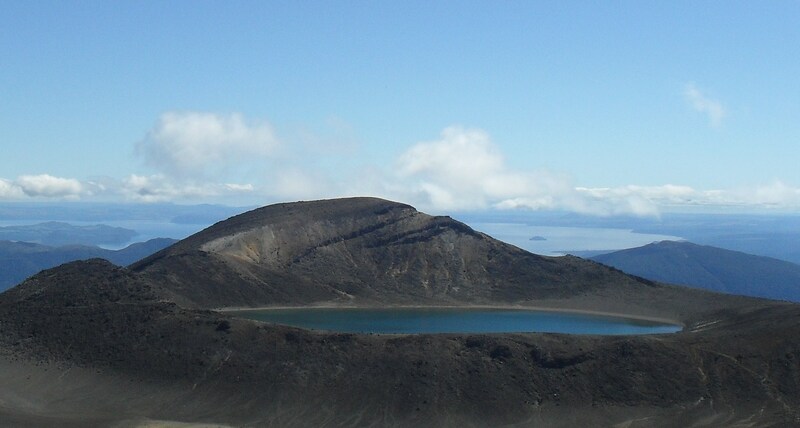 Taupo is another crater, it blew the middle out of the North Island in AD 230…. apparently ash and dust spread for 80km and in China it was noted that there was an unusual glow in the sky at that time. Thats a pretty extreme eruption, and the lake is enormous. We carried on down, and down…. 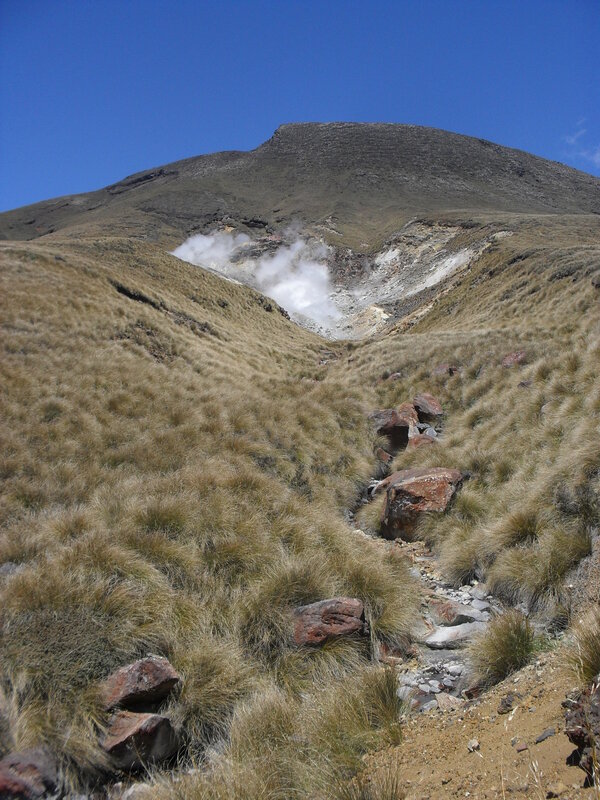 and down and down and down, past the Ketetahi Springs which are more geothermal pools, now inaccessible as they are tapu (sacred) to the Maori…. you can’t see the pools but you can see the steam and hear them bubbling! Do you know what? We had been on the mountain for about 6 1/2 hours before we came to a tree! A tree! It felt so unusual to walk past something living! What a strange experience! 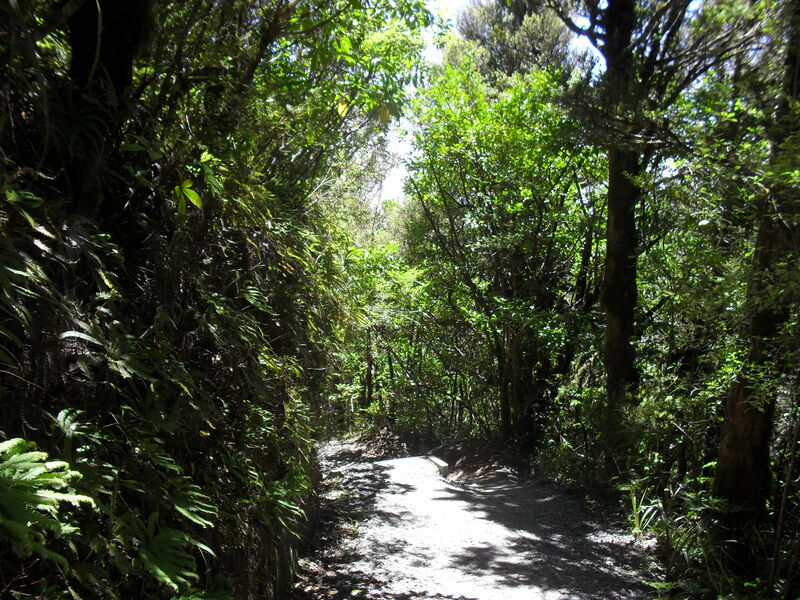 We finished the tramp with an hour of bush walking, which was blissful as it was 1.30pm and the sun was bright and hot…. 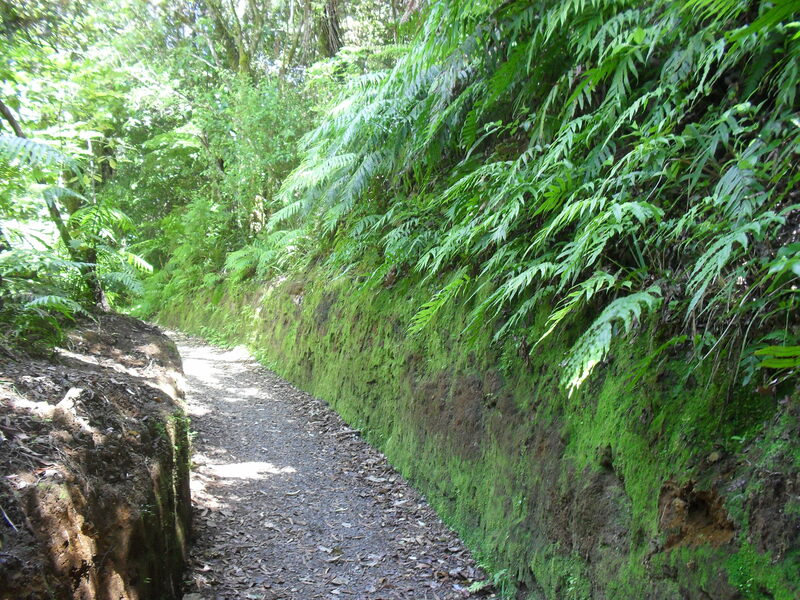 I love native bush as much as I love volcanoes…. That last hour was the perfect way to end the perfect tramp… by this stage my legs were walking by themselves and I was visualising that moment when Ross the shuttle driver showed up to take us home for a nice big lie-down…. And finally we made it, and I felt like a million bucks. The sense of achievement was huge and the tramp, though not the largest, most difficult tramp ever, was life-changing. A few days later, I’m finally able to walk properly! Ha! Well I hope you enjoyed that trip across Tongariro! 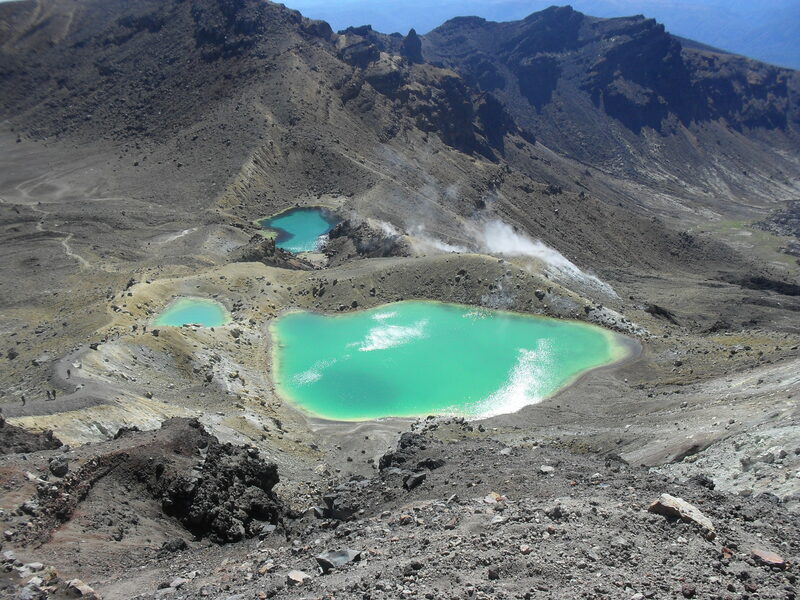 My next big challenge is going to be Ruapehu… there’s a lake in that crater that I want to see! Tomorrow I’ll pop back with some lovely things I bought…as well as some crochet goodness of course too! I’d better dash… KB and I have plenty to catch up on and Raymond seems to want to get on my lap… maybe he missed me! Maybe! This entry was posted in Travelling NZ!. Bookmark the permalink. 34 Responses to Volcanic Adventures! Hey Alice glad you had a good trip. That volcanic area looks stunning! Very dramatic and in some places looked like you could have been on the moon! I had the pleasure of completing that very same walk several years ago and absolutely loved it. I was staying at a back packer hostel in the area and the staff dropped a group of us off and picked us up at the other end. Following that they took us to a local public thermal pool where we soothed away our aches. The thermal pool was like magic as I didn’t hurt a bit afterwards. But I remember the vibrant colours of the lakes contrasting with the grey background was just spectacular. Thank you for that. The colours of the lakes are amazing. Congratulations on your flickr group and winning the give away. breathtaking photos,thank you for letting me imagine i was there amidst all the loveliness…….beautiful! nature is just incredible and awe inspiring. the vibes there must have been amazing, do tell about them in a post. catch up soon and congrats! Wow! Stunning photographs. Congrats on winning the giveaway, I’m off to visit the flickr group!! Hello Alice! That was the Extra ordinary Trip! Thank you for taking us with you! We have seen that kind of photos but when some one we know, has been there we can understand that those unbelievable places really exists! Unique beauty! It certainly was the most exiting but also tired day! Here in Chania we have the famous ‘Samaria’ gorge, which is about 17 km but you need almost all the day for that! I don’t even dare to think to pass that with my ‘0 shape’. I shall go to see your photos again! Hullo Alice, welcome home. Thanks for sharing your little holiday with us. Those photos are fabulous. Wonderfully adventurously and humanly described Alice – I feel as if I had a real share in your tramping triumph. Thanks for sharing Higgins. Raymond doesn’t even know he has a doggie brother elsewhere on the planet. My son lives in Wellington also and he and his girlfriend and planning this exact walk soon, i’ve just posted him a pair of hiking boots for it. 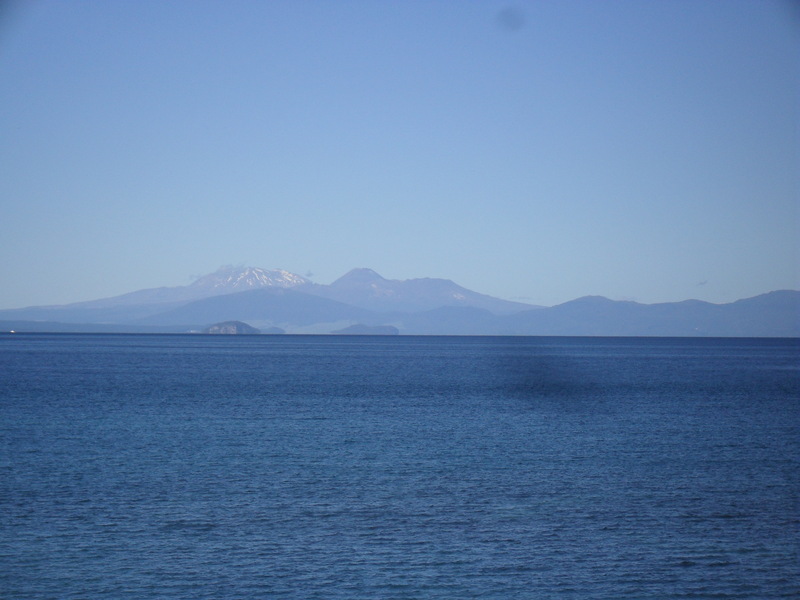 I loved your pics, I was lucky enough to see Lake Taupo myself last April with the volcanoes in the distance, beautiful. Absolutely amazing shots Alice. I really enjoyed taking the ‘trip’ with you – although I’ve never done anything like that, it brought back memories of when I lived in NZ. Those tree ferns are stunning. Great veiws..Thank you for these..Nice to share. Dont think l would walk as far as you did but then l was in Sydney the other wk & walked my little legs off..The lake was just lovely in yr pics..Very pretty..Best Wishes, Pam Clarke. Over the other side of the Ditch. Congratulations on winning that AMAZING give away!!! It will look stunning on you. And congrats too on your tribute flicker group. What stunning photos of your holiday. It really is a lunar landscape. I can’t help but think that the Red Crater photo makes me think of female anatomy (or maybe that’s just what I thought)! Maybe it’s Mother Earth giving birth to the world?! If anyone can make yarn a shade of blue the same as that lake I want the lot! That has to be my most favourite colour. Nice to be home with KB and Raymond though I bet. Wow, this world we live on has such beautiful places! Can’t remember if I have thanked you or not for the pattern for the pointy flowers, they are really easy I have posted some on my blog. So… thankyou! Oh, also the african flower. So lovely to have you back Alice, I do miss not seeing you in blogland when you are having a break. I will defnitely pop over to flickr to see all the beauties. NOW…… what can I say, I have LOVED this post, what an incredible country you live in and all that vast space and colours to die for, those pools !!! Thank you so much, it has been such a moment of uplifting for me to see all your fab photos. It once again makes me miss such giant spaces and natural earthly heaven that South Africa has, I love living in the UK but miss the enormaty of Africa. WOW, what an amazing walk you took us on, nature in all her glory, although at the moment she is not being kind here in Australia, as you know. Looking on the positive side, it has bought complete strangers together, helping each other to clean up etc. I am off to Flickr to have a little look. Pretty intense. Looks like a great way to get exercise, though! what a fabulous walk and such gorgeous views! What a wonderful trip! Your pictures are amazing! 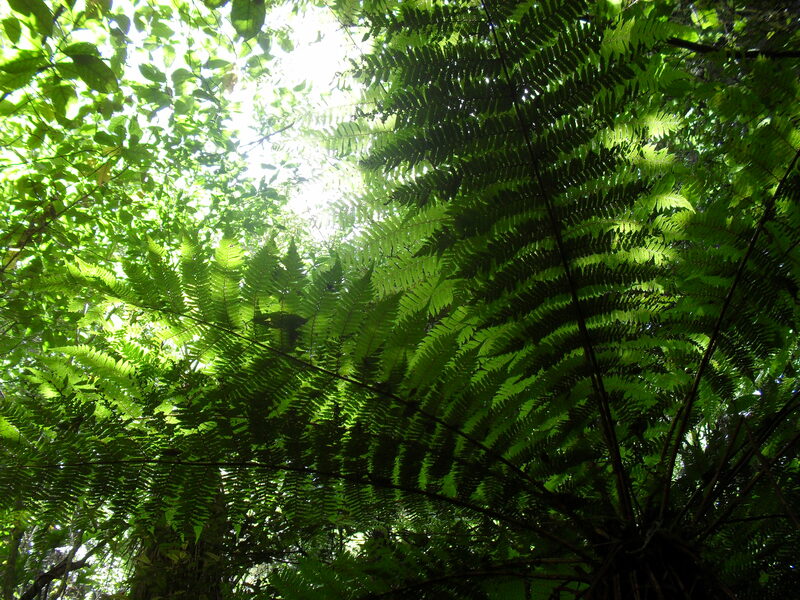 Beautiful photos, I love the picture of the fern especially. The color of the lake is awesome too. A little trip away sounds nice. Thanks for the mention of my blog and link to the flicker group, I get so excited when someone joins! Those lakes were beautiful….the colors!! I bet even more wonderful in person. What a neat adventure. wow!! amazing trip!!! so pretty pictures! thanks for sharing! Congratulations for your flickr group!!! The pictures are wonderful!! I called my other half over to see your photographs and we sat and sighed at them. A few years ago we came and spent a precious month on both north and south islands and loved every minute. He is a professed ‘non-blog-reader’ but I found him trailing through yours looking at the pictures and he pronounced Raymond excellent! Wow. Absolutely amazing. I hope next time I come to New Zealand I can see more than the tarmac! It’s just a breathtakingly beautiful country. Lucky you. I love your pictures! They are very very special and it is wonderful to share in your adventures. What a remarkable place you have just been to. It looks amazing and totally awe inspiring. I’m glad that some places are still treated as sacred – you can see why. What a shame we don’t treat all of the world with the care we should. It sounds like quite a trek you had and an exhausting one. But what incredible views! No wonder you describe it as life changing. So glad you took your camera with you and let us have a little look. I’ve really enjoyed seeing all the pictures and reading all about it too. Thanks for bringing it to us, I find it a magical place. Wish I could go! Lucky you for winning your ornament, it’s lovely – no wonder you wished hard, it’s so pretty.